Rocket League is already pretty sci-fi, but there’s an upcoming arena that aims to take it further by taking the car football shenanigans into space. For more news from The Game Awards, check the PCGN homepage. 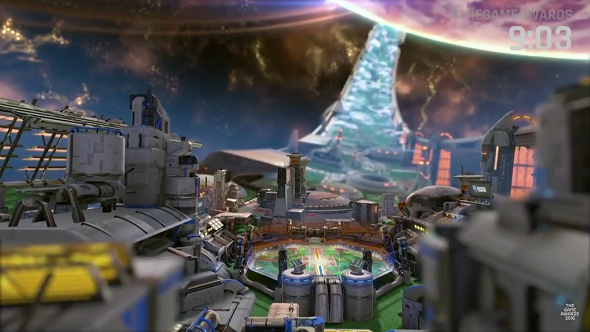 Starbase Arc is a new arena that sits within some kind of Halo-style planetary ring, so it definitely boasts the most visually interesting skybox in the game, at the very least. Along with the new arena, there will also be some funky and fresh music by Hollywood Principle feat Dr. Awkward. If you want to drop some money, you can also get the spaceship-esque Vulcan vehicle. It won’t offer you any advantages, but you’ll look bloody good when you lose. The new map releases on December 7, and you can check out the trailer embedded above.